Welcome to suduro.com, the home of Suduro, a fun, elegant new variation on Sudoku, with the challenges of Sudoku and Kakuro puzzles combined. If you already know and enjoy Sudoku, these offer a challenging new dimension to your puzzling. Fill in the gray squares with numbers 1-9 so that the gray squares in each column and row add up to the sums clues in the top-edge and left-edge black squares. 3-by-3 sub-grids. 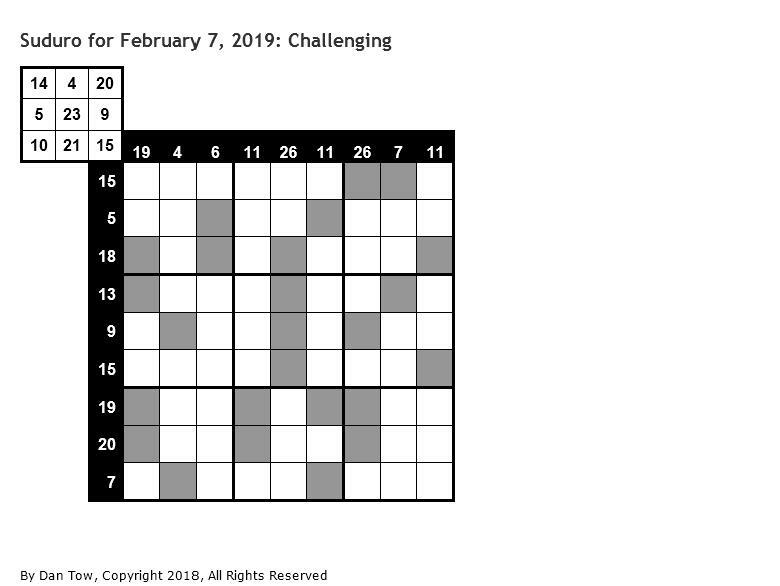 Fill in the white squares to complete a normal Sudoku puzzle, so every row, column, and 3-by-3 sub-grid has each number 1-9 exactly once. · Are you stumped? Here’s a more detailed Introduction to Suduro with a fuller explanation of the rules and solution strategies. · Still stumped? Here’s the Stage-1 answer (filling in just the gray squares). · Still stumped? Here’s the Complete answer. Want to email or blog a link to this specific puzzle? Here is the permalink. Publishers, book agents, newspaper editors, Dan Tow, the inventor of Suduro, has a book of Suduro puzzles ready for immediate publication. Here’s his email address, and the website for his day job. Stage-1 answer ; Complete answer. Puzzle Master has a large and unique collection of brain teasers & puzzles for sale. In addition they also carry chess, mechanical banks, puzzle books, magic trick books, boomerangs, etc.